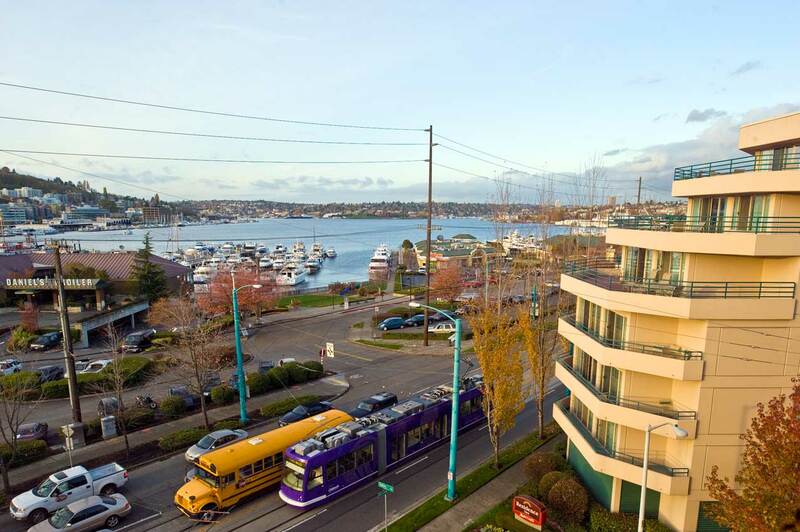 After Ford completed its Model T assembly plant at the south end of Lake Union on Fairview Avenue in 1914, the five-story factory afforded a fine prospect from which to inspect Lake Union. By 1920, a photographer from the Webster and Stevens studio found reasons enough to climb to an upper level of the plant and record this panoramic view looking north over Fairview Avenue. Building the Ford plant required considerable regrading, and the earth was distributed both across Fairview and to the site of the big Brace and Hergert lumber mill at the south end of the lake. A foreman at the mill, Alex T. Powell, owned the South Lake Inn Cafeteria on the far left. But if city directories are to be believed, Powell’s cafeteria did not survive the 1920s. The freshly graded Fairview seen here running diagonally was first platted as Southlake Avenue, a timber trestle, which was renamed Fairview once the boards had been mostly replaced with dirt and paved. The houseboats that hug most of the shoreline were pushed farther into the lake with the buildup of the avenue. The other row of floating vessels, in the middle of the lake, was known as “Wilson’s Wood Row” in reference to President Woodrow Wilson’s part in its creation. Most of the ships tied there were World War I wooden freighters built in the shipyards of Puget Sound for “Wilson’s war.” They were never used. This strange floating graveyard was a fixture on the lake into the 1930s. Seasonally, Wilson’s fleet was joined by another, one of tall-mast sailing ships resting for the winter in the freshwater lake. The 1932 completion of the Aurora Bridge prevented access to the lake by the tallest of these ships. Now: For the repeat, Jean Sherrard followed the historical photographer to the top of an old brick Ford Plant -- now a storage facility -- at the southeast corner of Valley Street and Fairview Avenue. This view is slightly intruded upon by the Residence Inn on the right.